When it comes to selling your product, one of the most influential factors in the consumer’s mind when making a purchase decision is packaging. Does the way you package your product line make the lasting decision influencing impression you intended? How do you ensure your products stand out in the marketplace? TABBIES® has been printing and converting high quality labels and films for packaging and industrial products since 1985. We provide paper and film solutions that help you and your customers create compelling graphics that project strong shelf presence, increase brand recognition and capture the consumer’s attention. Let us lend our years of expertise to your company’s label or packaging needs. Did you know: TABBIES® has worked with major brands like McDonalds, Burger King, Pier1 Imports, Baxter, Cardinal Health Care, Miracle-Gro, Walgreens, Best Buy & Costco-Kirkland, just to name a few. TABBIES® has the experience, expertise and equipment to handle all your custom label printing needs. We offer and stock a variety of materials, dies and adhesives to choose from and we have been successfully serving the needs of our customers across a wide range of products and industries for almost three decades. 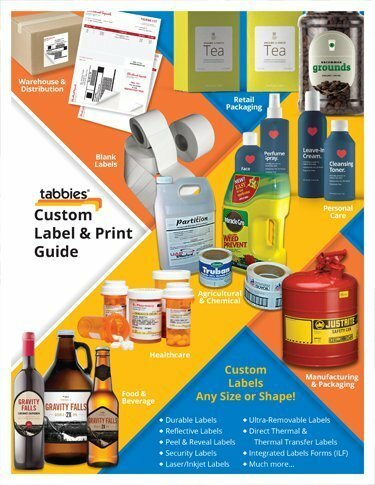 1-800-TABBIES (822-2437) for more information about how TABBIES can help with your next custom label printing job.